The apple orchard at the Wagram crossroad farm was established in two stages during 1975 and 1976. 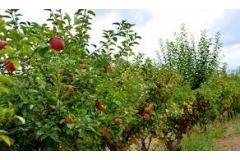 The predominant varieties grown are Cortland, Paulared and McIntosh, with smaller plantings of Spartan, Empire, Northern Spy and Golden Russett. The Dundalk Uplands can be a difficult location for apple growing, primarily due to the extremely cold and fluctuating winter conditions, but they afford some distinct advantages associated with excellent fruit color and flavor because of the frequent cool — even frosty — September nights. The learning curve for apple production in Ontario is vertical, and there were many lessons learned as the orchard grew to maturity. The orchard today is fully mature. It is operated using integrated pest management principles, where insect and disease threats are watched closely, as are beneficial predator populations. Sprays are applied only when necessary. Apple harvest typically begins around Labor Day, with Paulareds starting things off, followed by McIntosh and Cortlands about mid-September and Empire, Spy, Russett and a few Idareds finishing things off. Each variety has a “picking window” of a couple weeks or more. The first-picked apples are more tart at harvest, but they store better. The last-picked ones have incredible flavor at picking, and while they can be stored, they do not stay as crisp as the first-picked ones. That’s why the harvest for each variety is done on a multi-pick basis. Apples left on the tree for another week will size and color up appreciably, especially if the larger, more mature apples are picked first.